Wake Forest's skin printer deposits cells directly on wounds to heal them faster. Healing your wounds quickly and safely may be as easy as filling an inkjet printer with your cells. Wake Forest’s Institute for Regenerative Medicine (WFIRM) and the Armed Forces Institute for Regenerative Medicine (AFIRM) have developed a skin printer that can deposit cells directly onto a wound to help it heal faster. They recently presented the results of their latest experiments at the American College of Surgeons Clinical Congress (ACSCC) in Washington DC. 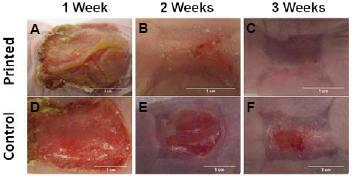 Mice given topical wounds were able to heal in just three weeks when a new skin was printed onto the damaged area (compared to 5-6 with control groups). WFIRM and AFIRM also stated that the skin printer had been tested to see if it could print human cells, but that the next step forward would be experiments on pigs. If ultimately successful, skin printers could revolutionize the way we treat injuries – making serious wounds less fatal and rapidly speeding the healing of other injuries. The differences between mice who received skin printing for their wounds and those that didn’t are staggering, as you can see in the images below. At 2 weeks, the treated mice had their wounds nearly healed, with only small portions still open. Untreated mice at the same time had open wounds 4 times as large! WFIRM reports that the untreated mice were also more sluggish and lost weight. Yeah…an open wound will do that to you. Mouse wounds healed better and faster with the skin printer. Treated mice also stayed healthier during healing. For those who keep regular track of WFIRM, you’ll notice that many of the results presented at ACSCC were shown earlier in April of this year. Clearly, the team’s work with mice has been ongoing. The poster discussed at the recent conference, however, gives some valuable insights into how the skin printer actually works. Two different printing heads are used – one with skin cells, a coagulant, and collagen; the other with a different kind of coagulant. Keeping these substances separate allows them to be deposited easily (like ink) but then quickly bond together and form a solid skin covering with fibrin. At this point, it’s too soon to know when skin printing will finally make its way to humans. There are some promising indications, however. The mice tests are a good sign that skin printing will work on other mammals. Likewise, the WFIRM/AFIRM teams announced at ACSCC that they could print human cells onto a fake human wound using the skin printer. Taken together, these developments look promising in the years ahead. 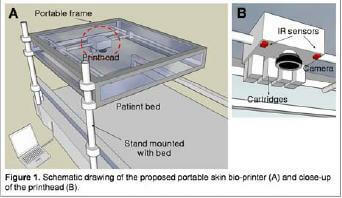 WFIRM has also been drawing up plans for a human sized skin printer that could fit on a hospital bed. If and when it arrives, skin printing will help transform hospitals – serving as another valuable tool (like stitches and staples) in the surgeon’s arsenal. They will also be part of a larger trend of bio-printing. As we’ve seen before, Organovo is working on ways to create entire organs by printing them cell by cell. While we still have to solve where all these cells will be coming from (tissue donors? stem cells?) bio-printing may be one of the next generation tools that allow us to heal any wound and replace any damaged organ. …Just don’t go scrapping yourself up anytime soon. The best of these technologies are still years away.